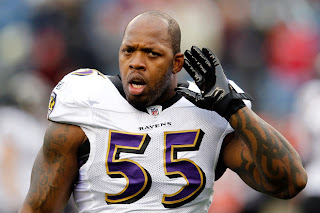 Terrell Suggs Speaks for America: Calls Skip Bayless a "Douchebag"
Terrell Suggs really hates Skip Bayless and that's been clear if you watch the trainwreck that is First Take. And Sugg was not happy this morning after his team lost a heartbreaker in the AFC Championship Game to the New England Patriots. When Suggs is pissed off, look out. Let's go to the videotape.